Learn the letters of the alphabet in this fun lotto game! Choose which side of the board you play on and try and be the first player to find all the cards that match the letters or pictures on your lotto board. There are 4 different ways to play: matching picture to picture, letter to picture, picture to letter or letter to letter! The different play styles develop with children's ability, from a simple picture matching lotto to more complex picture to letter matching - requiring children to think about the spelling of different words from their head. Alphabet Lotto features bold, colourful illustrations of recognisable animals and objects which children will relate to. 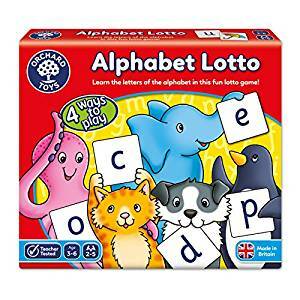 In every version of the game, children are encouraged to sound out the letters or words as they create them, developing their skills in phonics as well as alphabet and spelling.